The Select Board derives its authority from the Vermont Legislature. The Select Board must perform the duties directly assigned to it by the Legislature, which include the general supervision of the affairs of the town and seeing to it that duties required of towns and school districts (and not committed to the care of any particular officer) are performed. 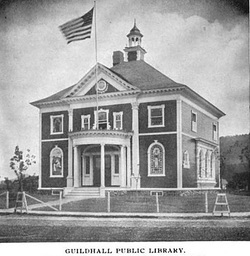 Meetings are held at the Guild Hall, Guildhall, Vt. on the 3rd Wednesday of the month at 7:00PM. Additional meetings are warned as needed; notice of them can be found on the "Notices" section of this website. If you would like to be on the agenda, use the contact form on the right to contact the Board. Draft (d) and Approved (a) minutes from recent meetings can be found in PDF form below. If you would like minutes from earlier meetings or have any questions, please contact the Town Clerk.